It’s hard to believe that Easter is next weekend. It’s so early this year! I never got around to bringing up the Easter decorations from the basement and in fact I think there are a few stray Christmas decorations still out around the house (oops). I have a hard time figuring out gifts for my kids when it comes to Easter. I feel like it’s a struggle between clutter and candy. My boys definitely do not need a basket full of candy, but it seems like all non-candy gift ideas end up as useless plastic cluttering up my house that will end up in the landfill sooner rather than later. I love to do homemade and DIY gifts. It’s usually a fun project for me and a more meaningful gift for the recipient. As I was searching around for DIY ideas for my kids’ Easter baskets I jotted down a list that I thought I would share today. Some of them are gifts I’ve made before for my kids for other holidays and the rest are ones I’d like to try. I tried to pick gift ideas that are meaningful, useful or consumable to try to fight back against clutter! Play silks are large pieces of silk, dyed in various colors to encourage imaginative play in kids. They can be used for dress-up, pieces of costume, parts of scenery, blankets, forts, curtains for puppet shows, etc. I made these for my boys for Christmas one year and we’ve gotten a lot of use out of them. The shipping was pretty fast on the plain silks I ordered so you probably still have time for this project if you order them soon. Slime is a fun science project to put together and it’s pretty inexpensive. It’s pretty neat how the glue, cornstarch and water interact to make slime. The options are endless when it comes to color and glitter add-ins. I made this for my boys last year for Valentine’s Day and they loved it. Put it in a clear plastic container and it would make a great addition to an Easter basket. Velcro stick art wins the award for the easiest DIY gift in the world. It will take you all of 15 minutes to put it together. All you need is big popsicle sticks, self-adhesive velcro and some kind of bag to hold it all. I made this for my boys for Christmas and it makes a great “busy” toy to throw in your purse or diaper bag to pull out at a restaurant or anywhere you are waiting. Use the colorful popsicle sticks to give this DIY gift a spring feel. I never thought to make my own bubble wands and was excited to come across this idea from Glued to My Crafts. My boys have already been asking to get out the bubbles this year and we need to refresh our supply. A homemade version is right up my alley, however I will have to find a plastic container for the bubble solution. I made a magnetic fishing game for my boys for Christmas one year and it turned out really cute. I used the template and directions from Homemade Gifts Made Easy. I was pleasantly surprised to find that I had most of the supplies on hand already. Don’t want to sew? Try this non-magnetic paper version from Frog Prince Paperie. 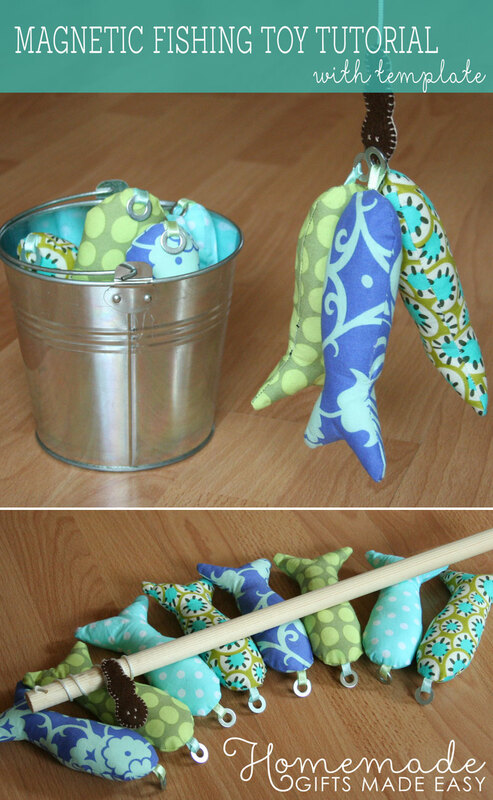 (I had to make the fabric one as my boys would’ve destroyed those paper fish in less than 24 hours.) There’s also a tiny felt version that fits in an Altoids tin at the bottom of the Homemade Gifts post. I would like to make that one too. Continuing with the magnetic theme I also found a great idea for magnetic Easter eggs at Frugal Fun for Boys. 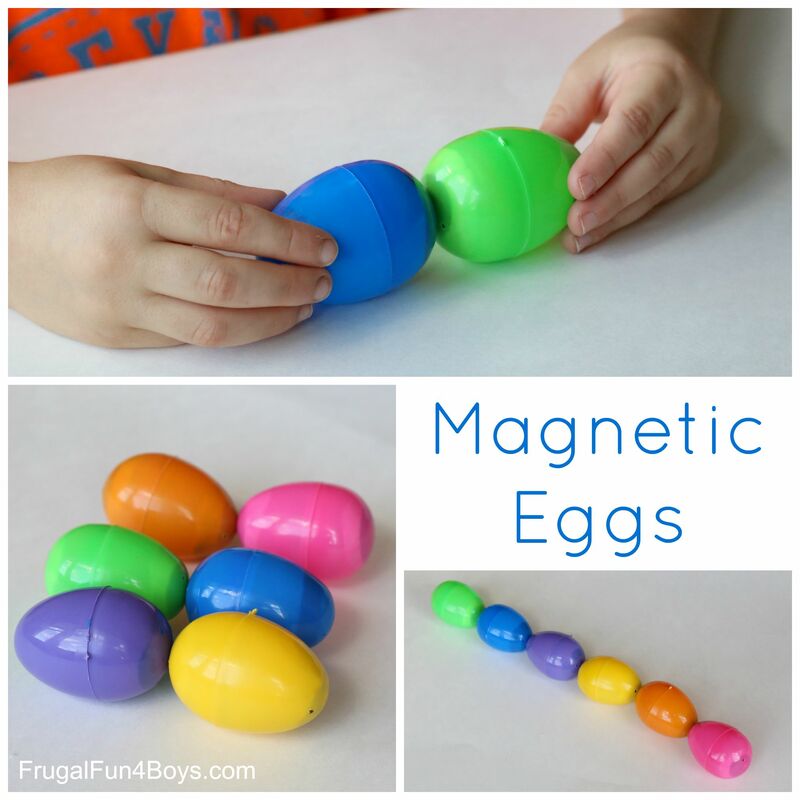 My boys love magnets and they love playing with those plastic Easter eggs, so I think they would like magnetic eggs a lot. I am a little concerned about them opening them though so I would have to find a way to glue them shut. My mother-in-law made my whole family KC Royals pillowcases for Valentine’s Day (we are big Royals fans). She even ironed my boys names on the sides of theirs with iron-on letters. It was such a nice gift! 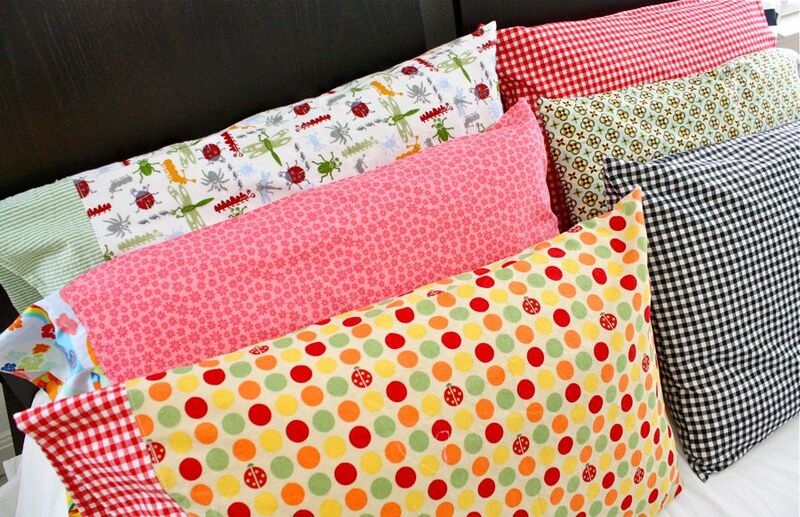 A custom, homemade pillowcase would be a fun addition to an Easter basket. Pick fabric in a favorite character or sports theme or fun print and iron their name on the side. Here is an easy tutorial from Made Every Day. Homemade playdoh carrots are such a great idea from Made to be a Momma. It’s a little bit of work to mix up the playdoh but it would look so cute in an Easter basket. I’ve never made homemade playdoh before but have always wanted to try. Homemade bath bombs are something I haven’t tried before as I don’t really take baths myself. However my kids love baths and I’m sure they would find a fizzy bath bomb hilarious. (They are two and four so it doesn’t take much.) There are a ton of ideas on Pinterest but I think this one from Coupon Closet looks easy and simple. Homemade bubble bath would be even simpler if you don’t want to mess with the molds. Find a fun bottle and fill it with this calming bubble bath solution. I think sidewalk paint is one DIY gift that I will definitely be trying this weekend. A couple containers with bright colored paint and some paint brushes would be perfect for an Easter basket. I like this idea from Ashley’s Homemade Adventures because it’s washable. The hardest part will probably be finding the right containers. I might try the squeezable condiment bottles with the pointy tips which my kids could use to squirt the paint straight on the driveway and skip the brushes all together. 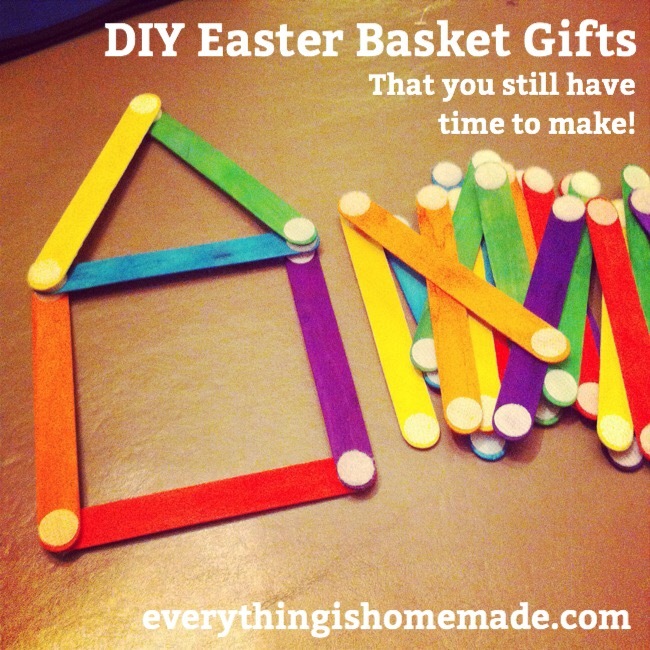 I hope this list has been helpful and may inspire you to try a DIY gift this year. Please share any other ideas! I’m a total procrastinator and I’m sure I’ll be working on my Easter baskets next Saturday night. Please feel free to pin this post and if you like, follow me on Pinterest. Thanks for adding my homemade sidewalk paint to this list. These are all really great ideas! I hope you like the paint, my kids have been asking me to make more so I think we will be making it again this weekend 😀 Using condiment bottles to squirt the paint sounds really fun. I hope your family has a Happy Easter.